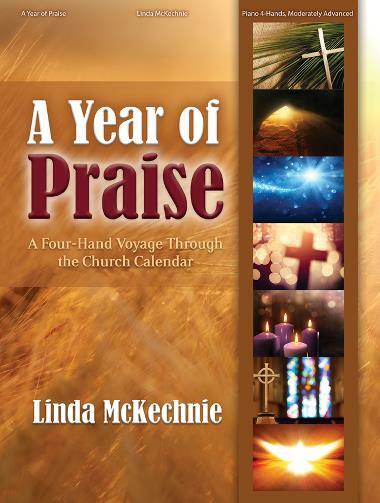 Linda McKechnie provides four-hand piano teams with beautiful and challenging hymn arrangements that highlight major events on the church calendar. She demonstrates her signature trademark of blending beloved hymns with favorite classics, incorporating timeless themes from Bach, Handel, and Faure in some of the selections. 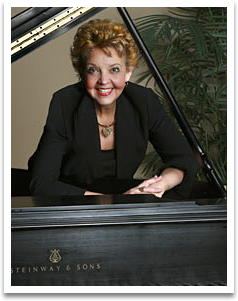 "A Year of Praise" is a superb addition to a skilled pianist's repertoire. Click on blue highlighted title to listen to entire arrangement of piano and orchestra recording. It is highly advised that you be very familiar with the music from the listening CDs in helping to learn to follow the accompaniment tracks. The ultimate goal is to play as if “the orchestra was following the piano” instead of the pianist following the track. Some arrangements are more difficult than others and are not consistent in level of proficiency or complexity of the orchestration. The piano music for CD track can NOT be performed as “piano solo only”. It is only performed with CD track accompaniment or organ part. CD track includes 8 titles from Hymnworks II and 10 titles from Hymnworks Christmas. The following music on both Hymnworks II and Hymnworks Christmas is to be played with the CD accompaniment track. These are not "piano only" arrangements. Click on blue highlighted title to listen to entire arrangement of piano. Although there is orchestration on these recorded arrangements, this book is a SOLO PIANO BOOK. Orchestrations are also available. Click on blue highlighted title to listen to entire arrangement of piano. Although there is no orchestration on these recorded arrangements, this book is a SOLO PIANO BOOK. Published Orchestrations are available. BONUS! includes orchestra track with and without piano. Under separate published categories, these arrangements are also available for duo keyboards, piano and orchestra, piano with treble instruments, handbells with organ/flute, or handbells and orchestra. Look under "published music"